Hypertrophic cardiomyopathy (HCM) is defined by the presence of a hypertrophied, nondilated left ventricle in the absence of secondary causes of hypertrophy (e.g., systemic hypertension or aortic-valve stenosis) (121). Although hypertrophic cardiomy-opathy was previously considered a rare disorder, recent evidence indicates that the prevalence of hypertrophic cardiomyopathy in the general population is about 0.2% (1 in 500) (122,123). Patient with hypertrophic cardiomyopathy are frequently referred to electrophysiologists for management of several important complications of the disease: primary and secondary prevention of sudden cardiac death, AF, and consideration of pacemaker implantation in patients with hypertrophic obstructive cardiomyopathy (HOCM) who have symptoms that are refractory to medical management. Sudden cardiac death is an important clinical problem in patients with HCM. A substantial proportion of patients with hypertrophic cardiomyopathy who die prematurely collapse during or immediately following vigorous physical activity. In the United States, hypertrophic cardiomyopathy is the most common cause of sudden death on the athletic field in young competitive athletes (91). Many patients who die suddenly have previously been asymptomatic; in these individuals, sudden death is the first manifestation of the disease. The annual incidence of sudden cardiac death is 2-4% in studies conducted at tertiary referral centers (124), but appears to be substantially lower in community-based populations (<1%) (125,126). These data have important implications for the development of strategies for the primary prevention of sudden cardiac death. Although numerous risk factors for sudden death have been described in patients with HCM (Table 7), the positive predictive value of abnormal findings is low because of the relatively low incidence of this catastrophic complication. Myocardial ischemia (particularly in young patients) Impaired blood-pressure response to treadmill exercise LVOT gradient >30 mmHg. * 2 or more unexpected sudden deaths in young family members. The development of an effective risk-stratification strategy is critically dependent on a thorough understanding of the mechanisms of sudden cardiac death in patients with HCM. The myocardial structure in HCM is characterized by myocyte disarray, hypertrophy, and fibrosis (127). All of these features contribute to nonhomogeneity of electrical conduction and dispersion of repolarization, which form the substrate for reentrant ventricular arrhythmias. The available data suggest that ventricular tachyar-rhythmias are the cause of sudden death in most patients with HCM, either as a primary event related to an arrhythmogenic substrate or as a secondary phenomenon triggered by myocardial ischemia, diastolic dysfunction, abnormal vascular control, outflow-tract obstruction, or supraventricular arrhythmias (128). There is little doubt that the highest-risk patients with HCM are those who survive a cardiac arrest with documented VF or who have spontaneous episodes of sustained VT (128). In addition, young patients with a substantial family history of sudden cardiac death (defined as a cluster of two or more sudden deaths in young family members) or a high-risk genetic mutation are also at extremely high risk (128). Hypertrophic cardiomyopathy is now recognized to be a genetic disorder with autosomal dominant inheritance (129). All of the genes that have been identified encode proteins of the cardiac sarcomere: the P-myosin heavy chain (130), cardiac troponins T (131), and I (132), a-tropomyosin (131), myosin light chains (133), and myosin-binding protein C (134). In addition, a locus in chromosome 7q3 has been linked to hypertrophic cardiomyopathy associated with Wolff-Parkinson-White syndrome (WPW) (135). Multiple distinct mutations in each gene have been identified, which have varying penetrance, functional consequences, and prognostic significance (129) (Fig. 11). In the case of troponin T-mutations, outflow obstruction is absent and symptoms are typically mild, but a substantial risk for sudden cardiac death is present (131). It is estimated that less than 50% of hypertrophic cardiomyopathy cases are accounted for by these genes (129). Genetic screening is presently performed by only a few specialized centers worldwide, and is therefore seldom obtained for many kindreds; however, when this information is available and the prognostic consequences of the mutation in question have been previously characterized, the results can be used to guide management. has been the subject of much debate. Early reports by two groups indicated that the presence of NSVT was associated with a 7-8% annual mortality rate (136,137). These data prompted the widespread use of prophylactic amiodarone in patients with hypertrophic cardiomyopathy and NSVT. Recent evidence indicates that NSVT is not associated with an adverse prognosis in asymptomatic patients (138). In addition, short, isolated runs of NSVT do not appear to be a marker of high risk (only one burst in 24 h, <5 beats in duration) (138). Repetitive, more prolonged runs of NSVT are of greater concern, especially in patients who present with pre-syncope/syncope. The utility of invasive EPS for risk stratification has been investigated by a number of groups. 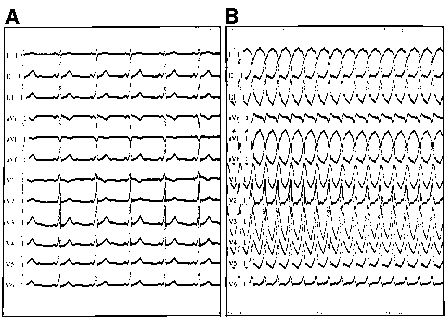 The induction of sustained monomorphic tachycardia is unusual in hypertrophic cardiomyopathy patients, and much controversy has centered on the significance of induced PVT/VF. Some authors have postulated that the induction of sustained PVT with two extrastimuli is a specific marker of an adverse prognosis; however, this finding is infrequent (10-15% of patients) (139). In several small studies, induced PVT with three extrastimuli was not associated with an adverse prognosis (140,141). In contrast, Fananapazir et al. reported in a large series that sustained PVT induced with three extrastimuli was a specific marker of an adverse prognosis in patients with or without symptoms of impaired consciousness (139). It is possible that the adverse prognosis of induced PVT was partially attributable to patient selection, as many of the patients who were inducible also had high-risk clinical features (such as prior cardiac arrest or syncope). Other authors have raised concerns regarding the safety of programmed stimulation in patients with HCM (142,143). Given these safety concerns and the lack of consensus regarding the interpretation of the results of testing, EPS is not currently recommended for risk stratification of patients with HCM. Other factors associated with an increased risk for SCD include recurrent syncope (128), an impaired blood-pressure response to exercise (144), inducible myocardial ischemia (145), left ventricular outflow-tract pressure gradient >30 mmHg (146), marked left ventricular hypertrophy (LVH) (>35 mm) (128), and young age (<14 yr) (129). In children, ischemia provoked by myocardial bridging of the left anterior descending coronary artery appears to be associated with VT and SCD (147,148). Patients with aborted cardiac arrest or spontaneous sustained ventricular arrhythmias, a strong family history of premature cardiac arrest, or a "high-risk" genetic mutation constitute the highest-risk subset of patients with HCM. There is general agreement that prophylactic treatment is warranted for patients who meet these criteria (128). The available data indicate that amiodarone does not provide complete protection from sudden cardiac death and may in fact be proarrhythmic at higher doses (149). Although no randomized comparative studies have been performed, ICD implantation appears to offer superior sudden-death protection (150,151). The reported incidence of appropriate shocks during follow-up among cardiac arrest survivors with HCM who underwent ICD implantation is 15-50% (150,152,153). Every effort should be made to address other factors that may contribute to recurrent ventricular arrhythmias, such as myocardial ischemia, severe outflow-tract obstruction, or supraventricular arrhythmias. Pediatric patients who have demonstrable myocardial bridging may benefit from surgical unroofing of the left anterior descending coronary artery. Similarly, cardiac-arrest survivors with severe outflow-tract obstruction should be considered for procedures that reduce the gradient (septal myectomy, permanent pacemaker, ethanol ablation). Patients who are asymptomatic and who do not have any high-risk clinical features (Table 7) do not warrant specific treatment for the primary prevention of sudden cardiac death (154). It is important to stress that this subset comprises a sizeable proportion of the patients with HCM, especially in community settings. All patients who are diagnosed with HCM should avoid strenuous physical activity such as competitive athletics (155). It is often difficult to decide whether to recommend aggressive prophylactic treatment for patients who have one or more high-risk clinical features. This is particularly true of patients who present with syncope. Many patients with HCM report isolated or remote episodes of syncope (126,138). These patients should generally be managed conservatively with noninvasive tests such as Holter monitoring to quantify ambient ectopy and patient-activated event recorders. Therapy should be individualized for patients with recurrent syncope and one or more additional high-risk features; our practice has been to recommend ICD implantation in these instances. up; in addition, >50% of patients with this arrhythmia experienced disease progression or died during the study period (Fig. 12) (126). In rare instances, rapid AF can provoke malignant ventricular arrhythmias and sudden cardiac death, either by a triggered mechanism, the induction of myocardial ischemia, or by causing prolonged hypotension (Fig. 13) (150). In the majority of patients with hypertrophic cardiomyopathy, the adverse prognosis associated with AF is more closely related to exacerbation of CHF, systemic embolism, and stroke (156). Paroxysmal episodes of AF often cause rapid clinical deterioration by reducing diastolic filling and cardiac output, usually as a consequence of the high ventricular rate. When the ventricular rate is well-controlled patients may remain asymptomatic, particularly when outflow-tract obstruction is absent. 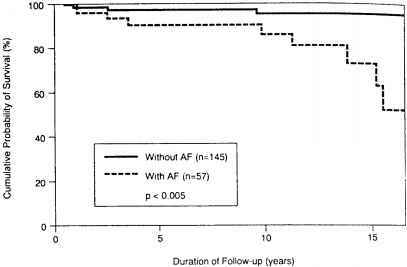 Several risk factors for AF have been identified in patients with hypertrophic cardiomyopathy, including age, increased left atrial size, marked hypertrophy, and the presence of outflow-tract obstruction with concomitant mitral regurgitation (136). 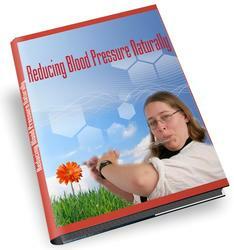 Management consists of control of the ventricular rate using either verapamil or beta-blockers, anticoagulation to prevent systemic embolism, and administration of agents to maintain sinus rhythm. 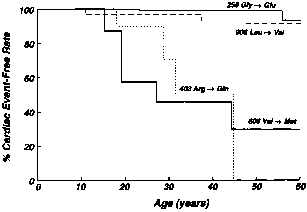 Amiodarone is the most effective agent for the maintenance of sinus rhythm (157); however, in young patients, consideration may be given to an initial trial of sotalol because of the toxicity associated with long-term amiodarone administration (127). Some individuals with obstructive HCM and AF may be candidates for septal myectomy, which may reduce left atrial size and restore sinus rhythm by this mechanism (158). Dual-chamber (DDD) pacing, with the right ventricular lead positioned in the right ventricular apex, has been proposed as a therapeutic alternative for patients with HCM who have outflow-tract obstruction, and who are symptomatic despite maximal medical treatment with beta-blockers or verapamil. It is important to emphasize that patients who meet these criteria comprise only 5% of all patients with HCM (128). Results from several uncontrolled studies indicated that pacing produced a dramatic reduction in the magnitude of the left ventricular outflow-tract gradient and sustained symptomatic improvement (159,160). These data have led to a widespread enthusiasm in the cardiology community for pacing as a treatment for HCM. The recent publication of three randomized, crossover trials (DDD pacing vs inactive pacemaker) has prompted a reevaluation of the utility of pacing for the treatment of HCM patients with refractory symptoms (161-163). In particular, it appears that much of the apparent benefit of pacing in HOCM is caused by placebo effect (164). The theoretical basis for the use of pacing for the treatment of patients with HOCM is derived from the results of acute hemodynamic studies. Atrial synchronous right ventricular apical pacing, with a short atrioventricular delay produces preexcitation of the interventricular septum, which causes the septum to move away from the left ventricular wall during systole, resulting in an increase in left ventricular outflow-tract dimensions and relief of outflow-tract obstruction (159). Although the atrioventricular interval must be short enough to maintain complete ventricular capture, pacing at extremely short atrioventricular intervals may also have adverse hemodynamic consequences, such as increased filling pressures and diastolic dysfunction (165). For these reasons, an acute hemodynamic study is performed to select the longest atrioventricular interval that maintains complete ventricular capture without a detrimental effect on blood pressure, cardiac output, or left atrial pressure (165). pacing or AAI pacing at 30 BPM (inactive pacemaker). After 3 mo, the pacing mode was reversed. The LVOT gradient was modestly decreased with DDD pacing (55 ± 38 mmHg) compared to either AAI pacing (83 ± 59 mmHg) or baseline (76 ± 61 mmHg). The Minnesota quality-of-life score and exercise duration were significantly improved with DDD spacing compared to baseline but were not significantly different from AAI DDD pacing. Overall, 63% of patients had symptomatic improvement with DDD pacing, but 31% had no change and 5% had deterioration of symptoms. Strikingly, 42% of patients had symptomatic improvement with backup AAI pacing, which indicates that placebo effect may account for most of the apparent symptomatic benefit associated with pacemaker implantation. These data were subsequently confirmed in the M-PATHY trial, which enrolled 48 symptomatic hypertrophic cardiomyopathy patients (77% class III or IV) with resting gradients >50 mmHg (163). One potential flaw of this study was that a decrease in the gradient during the acute catheterization study was not required for study entry; however, others have reported that patients who do not manifest an acute drop in gradient also respond to chronic DDD pacing (166). The study design was similar, with randomization to either DDD or backup AAI pacing for 3 mo followed by a crossover phase. A modest decrease in outflow-tract gradient was noted in 57% of patients, but 43% of patients had either no change or an increase. No differences were found between pacing and no pacing for any subjective or objective measure of symptoms or exercise capacity. A post-hoc analysis indicated that elderly patients (age >65 yrs) showed a clinical response to DDD pacing, but these data require prospective confirmation. The results of the M-PATHY trial were also corroborated by the Pacing In Cardiomyopathy (PIC) Study Group (161). This trial enrolled 83 patients with class II/III symptoms and LVOT gradientsss of >30 mmHg with or without provocation. This study also had a randomized crossover design, with consecutive 3-mo follow-up intervals. In this study, a similar improvement in angina and dyspnea was noted with DDD pacing and AAI pacing compared to baseline, and no difference in objective measures of exercise capacity was found. At present, DDD pacing cannot be recommended for the routine treatment of patients with HOCM who have symptoms that are refractory to medical therapy. In experienced centers, septal myectomy can be performed with minimal complications, greater relief of outflow-tract obstruction, and more profound symptomatic benefit (167). Ethanol ablation of the septum may also provide effective relief of outflow-tract obstruction, although the procedure can be complicated by heart block and concerns persist regarding late development of ventricular arrhythmias (168). DDD pacing should be reserved for those patients who are judged to be unable to tolerate surgery. Further studies are required to determine if the elderly patients with HOCM derive a benefit from DDD pacing. Is atrial fibrillation common with hypertrophic cardimyopathy? Can hypertrophic cardiomyppathy cause a fib?